Lilac Cottage lies in Kilmuir in the southern part of the Black Isle. The village is not far from Inverness, but it is fairly secluded as, by road, it is placed at the end of a narrow single track road. It lies on the northern shore of the Moray Firth and east of the Kessock Bridge, below Ord Hill, at the top of which lies an ancient fort. There are excellent walks to the top of Ord Hill which gives panoramic views west down the Great Glen, south to the Cairngorms and east out towards the North Sea. The resident Moray Firth dolphins travel up the stretch of water in front of the cottage as they pass through to feeding grounds in the Beauly Firth. At nearby North Kessock there is a seal and dolphin information point with hydro phones to listen to the sea-life. Further east on the Black Isle is the famous Chanonry Point viewing point where the best and closest views of the dolphins are achieved. The local community owns woodland behind the village and on the slopes of Ord Hill. If you park your car near the churchyard there are marked walks from there to the village, to North Kessock, and circular routes following the coast towards Munlochy Bay. The Black Isle has many attractions for visitors and the various villages each have their own character - but all offer excellent dining out opportunities! Mountain biking at Eathie is both challenging and rewarding as is sailing and kayaking from Fortrose. There are fishing and dolphin watching trips from Cromarty and Avoch (pronounced 'och') nearby. 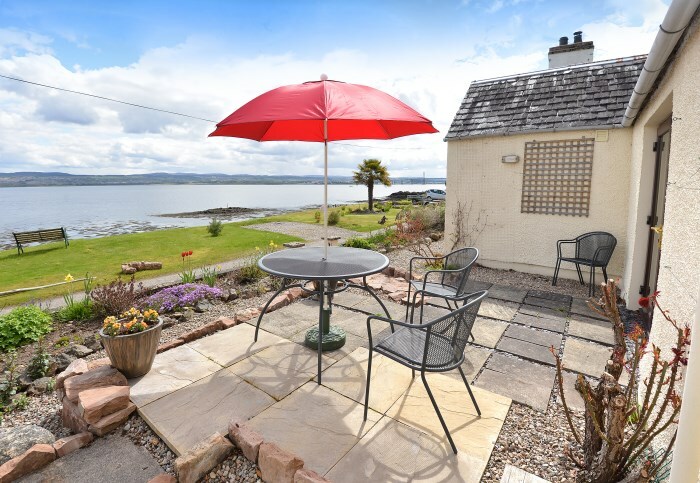 Alternatively, why not just relax into the timeless peace of this secluded hamlet and enjoy the view!